Poipu Kapili #53 - Best Value Ocean View Condo in Sunny Poipu! 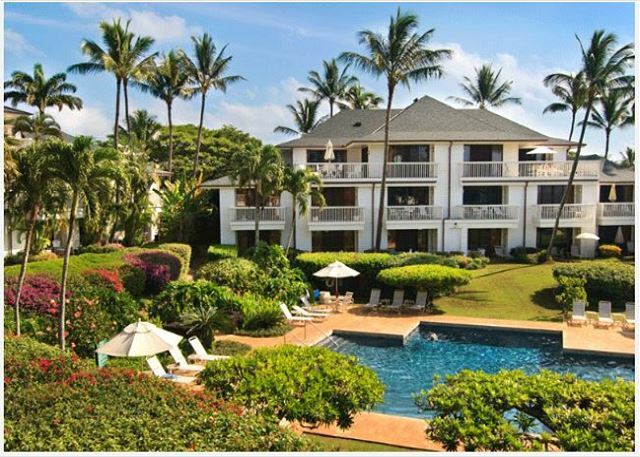 Located within walking distance to Kiahuna Beach as well as Koloa Landing. 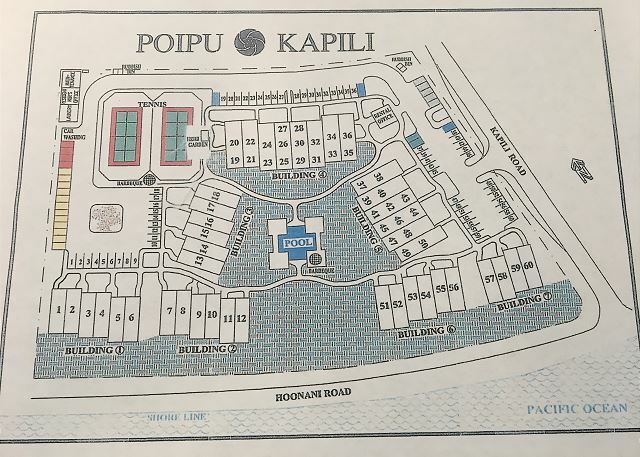 Poipu Kapili is conveniently located close to the Shops at Kukui'ula for some fine great dining and shopping! Ocean view. King Bed. A/C! master bathroom to left and plenty of closet space! This townhouse-style, 1800 square foot condo provides stunning views of the crystal blue Pacific Ocean from the kitchen, dining/living room and master bedroom. Both bedrooms are on the second level and offer air conditioning as well as ensuite bathrooms for guest privacy and personal comfort. The ground floor houses the foyer, third bath, laundry room with washer and dryer, kitchen, dining and living room. A private lanai off of the living room is an excellent place to sit and watch the sunset or sip a refreshing beverage and enjoy a good book! The quietly understated and elegant Asian ambiance of this lovely condo will help you relax and unwind Kauai style. A few of the amenities include a well-stocked kitchen, HD TV, I-Pod dock and WiFi. Outdoor amenities include charcoal and propane grills, pool, tennis and an herb garden for guest use. 1 king, 2 twins (can be pushed together upon request), sleeper sofa. Air conditioning in upstairs bedrooms only! Everything we could of ask for and more! Easy access to beach and ocean. Centrally located to shopping trips. Wonderful facilities. Large enough to fit our whole family comfortably. Aloha Stephanie, We are happy to hear that Poipu Kapili #53 was everything you could have asked for and more! We agree that it provides easy access to the beach, is in a great location and has wonderful facilities onsite at Poipu Kapili. We look forward to your return one day. Mahalo! This unit is spacious with a large downstairs and two bedrooms upstairs. The kitchen is nice. The location was perfect for us - just across the street from the ocean and within walking distance to two shopping centers. Aloha Greg, We are happy to hear that you found Poipu Kapili #53 to be a beautiful condo in a great location! We could not agree more that having the ocean just across the street and two shopping centers within walking distance is very convenient. We look forward to your return one day. Mahalo! Wonderful time in Paradise. We spent most of the time at or around our condo. We walked to the beach ( not crowded & and easily accessible) hung out by the pool, walked to see turtles (2 minutes from unit) and we were able to walk to 2 shopping area where we shopped for gjft and ate. Aloha Lynn, We are happy to hear you had a wonderful time in paradise while staying at Poipu Kapili #53! Getting to see turtles at Koloa Landing a short walk away is always a bonus. We look forward to your return one day. Mahalo!